Dr. Karen Ho, a third-year dermatology resident at Auburn University’s College of Veterinary Medicine from Weston, Wisconsin, placed nationally in two categories for her research presentations at the recent North American Veterinary Dermatology Forum. Dr. Karen Ho, a third-year dermatology resident at Auburn University’s College of Veterinary Medicine from Weston, Wisconsin, placed nationally in two categories for her research presentations at the recent North American Veterinary Dermatology Forum, or NAVDF, held in Maui, Hawaii. Conference presentations of their research are a requirement for veterinary dermatology residents by the time they are in their third year of residency. “My research is focused on learning more about how the antibiotic Rifampin interacts with the bacteria that it is designed to treat, and more about how it interacts with the dog,” Dr. Ho said. “Rifampin is an antibiotic that we use more frequently than we would like to treat methicillin-resistant infections. The ultimate goal of her research is for veterinarians to be able to prescribe more effective, safer and more appropriate medication doses, according to Dr. Ho. Objectives were to determine the minimum inhibitory concentration of rifampin needed to target specific organisms and to determine the killing properties of the antibiotic on the targeted organism. Dr. Ho says that her two studies provide supporting evidence for clinical trials to evaluate orally administered rifampin as well as the need for more studies to determine minimal doses needed to target specific infections. Dr. Ho received her Doctor of Veterinary Medicine degree from the University of Wisconsin’s School of Veterinary Medicine in 2012. 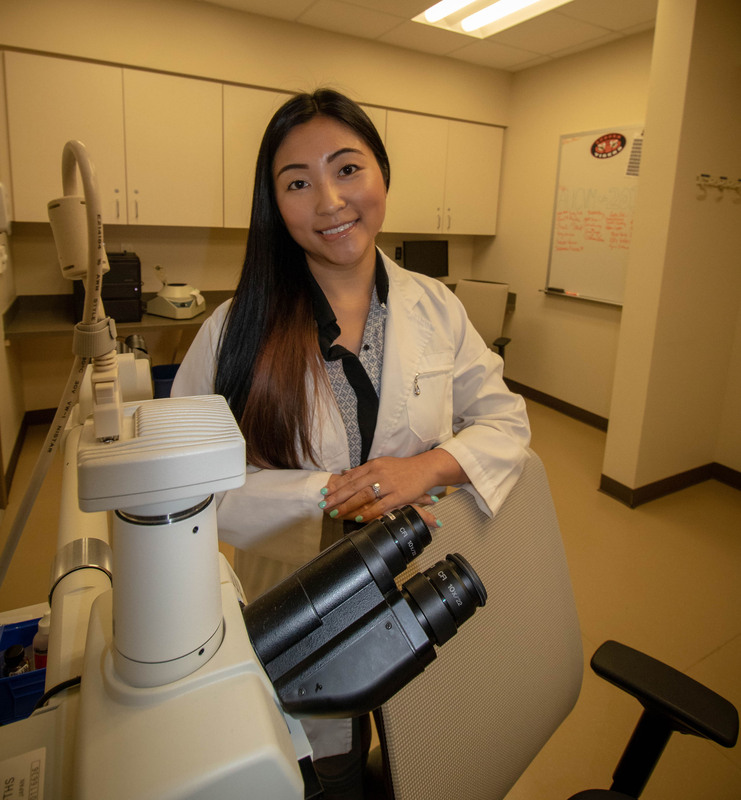 She completed a rotating internship at Blue Pearl Veterinary Partners in Tampa and dermatology internships at the University of Illinois and Texas Gulf Coast Veterinary Specialists. She will complete her three-year residency at Auburn in July and plans to relocate to Dallas to join a private dermatology veterinary hospital. Questions, story ideas or want more information?